The front interior lighting also incorporates the reading lights for the driver and passenger. – Move switch A to the centre position. – Move switch A to position I. – Move switch A to position O. – Press one of the switches B ⇒ fig. 62 to switch the left or right reading light on and off. If you switch on the courtesy lighting, the interior lights come on automatically when the vehicle is unlocked or the doors are opened. The light also comes on when the key is pulled out of the ignition. It goes out approximately 30 seconds after the doors are closed. 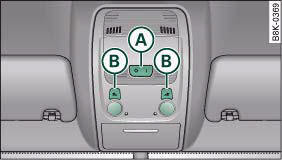 The interior light is switched off immediately when the vehicle is locked or when the ignition is switched on. 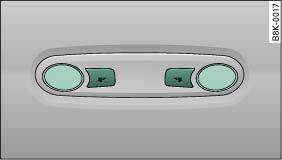 If a door is left open, the light is switched off after about 10 minutes to prevent the battery from running flat. The brightness of the light is automatically adjusted by a dimmer when it is switched on. Reading lights are also provided for rear passengers. The reading lights are switched on and off with the switches .